SINGAPORE (AP) — Donald Trump approached from the right, striding down the long portico at the colonial-era Singapore resort. Kim Jong Un, dressed in his familiar Mao suit, emerged from the left. They met in the middle, on a red carpet, dozens of cameras recording their every move, as the world watched. 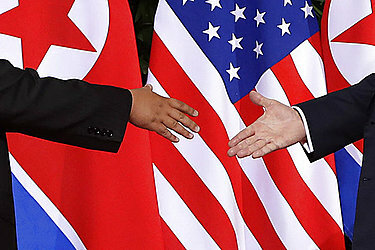 It was a single, quintessentially human movement — a greeting, a welcome, a start of a relationship — but the reaction to the handshake was as complicated as the standoff that the two countries these men represent have been locked in for seven decades now. Both Koreas have long demonized the other's national flag. It's illegal to show the North Korean flag in the South, and even during the recent inter-Korean summit in the Demilitarized Zone there was no sign of the North's flag. North Korea's anti-U.S. iconography dates to the war and regularly shows North Korean soldiers bayonetting the U.S. flag. Jung Chung-rae, a former lawmaker of the liberal Minjoo Party, tweeted that the handshake "shined with courtesy and respect" and that history will remember their "handshakes and smiles." South Koreans watching television screens in a train station applauded the moment Trump and Kim met. Media photos showed South Korean President Moon Jae-in smiling broadly during a Cabinet meeting at the Blue House while watching a television screen that showed Trump and Kim shaking hands in front of American and North Korean flags. "All the attention of our people is on Singapore," Moon said. "I, too, could hardly sleep last night." Critics, however, saw the handshake and Kim's earlier moonlight stroll as evidence Trump was helping to legitimize Kim as his equal on the world stage even though the North Korean regime has been accused of horrific rights abuses. During his stroll Monday along the glittering Singapore waterfront, crowds yelled his name and jostled to take pictures, and the North Korean leader posed for a selfie with Singapore officials. Adam Mount, a U.S. defense analyst, expressed anger about seeing the U.S. and North Korean flags side by side. ?